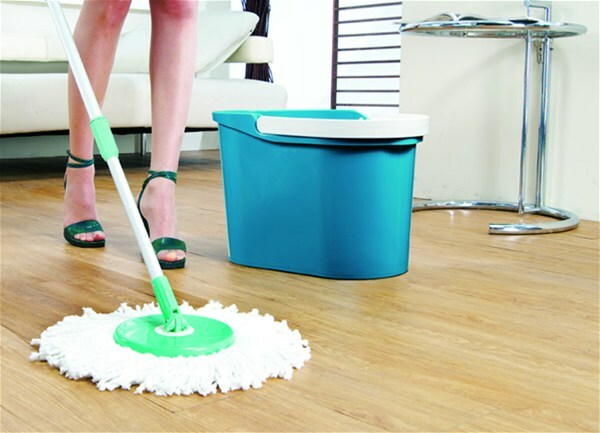 A spin mop, made popular by quality brands like Fuller, is a product that claims to simplify the house cleaning process. The spinning action and special bucket help in wringing out the mop while allowing users to clean floors without having to touch the dirty water. Assembling and using the spinning mop is a fairly straightforward process. To use the mop, it is important to identify the type of mop you are using, put the handle together, fill the bucket and start mopping. There are two basic models of spin mops available on the market. The standard model comes with the mop with handle, bucket and wringer system. The deluxe model is different from the standard in that it has an agitator in the water bucket. This is particularly useful in areas where there are dirty floors. The user just has to dunk the mop into the water and the agitator works at loosening the extra dirt and debris from the head cleaner. When using a spin mop for the first time, you will need to put the handle together. The mop’s handle has three segments. Place the middle handle screw into the top handle’s opening, and tighten until it makes about 10 clicks. Follow this procedure as you attach the bottom handle to the middle handle. When the handles are put together correctly, they will not come apart. Spin mop manufacturers claim that users can clean, polish and dust with this tool without ever needing to touch the dirty mop water. However, before you use the mop, adjust the handle to a comfortable angle – in some spin mop models. Place mop on floor and tilt the handle to one side until it clicks into place. Use the spin mop to clean your floors, dust and soak up spills. Mopping floors: Remove tough dirt and get your floors shining using the spin mop. Fill the bucket with warm water and your choice of cleaner. Make sure that you do not go beyond the fill line; otherwise, you will interfere with the wringer’s effectiveness. Place the handle in an upright position and dip mop into the basket. Hold the mop by the grip handle and step on the basket’s pedal to get it to spin. Remove mop from basket and mop your floor. Dusting floors: The microfiber head on spin mops can help keep you hardwood floors clean and shining. Simply move the mop along the floor and under the furniture. When head is bogged down with dust, rinse and spin in the mop bucket. Cleaning spills: The spin mop head can hold up to 10 times its weight in liquid. Clean all spill sizes by absorbing them with the mop. With time the mop head will get too dirty. Fortunately, some varieties are machine washable. Simply remove the head and wash in the washing machine’s gentle cycle with hot water and detergent. Allow the head to air dry. Press disc on handle to the mop head’s center to snap it back to place.